The reviews are nearly all positive, from critics as well as fans. 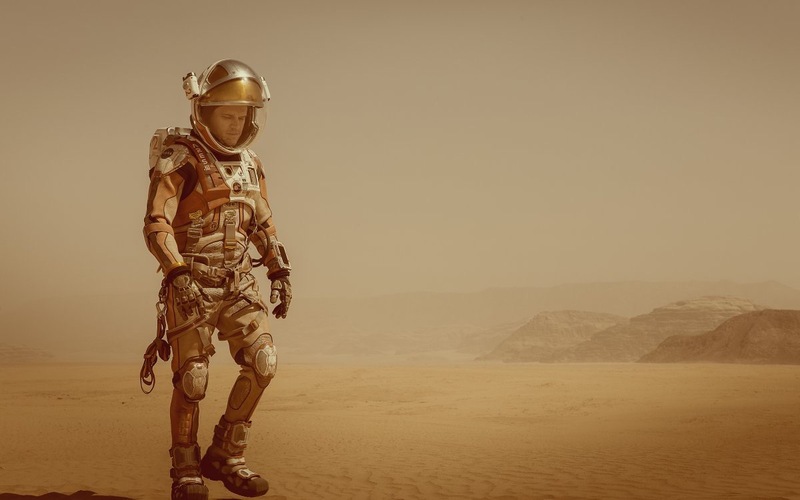 Andy Weir’s novel, The Martian, is a brilliant piece of hard science fiction, and the film adaptation is a sterling representation, likely to garner Oscar recognition. I’m staying away from both versions. I’ll have to take the word of the media that the story is great. I just can’t stomach partaking myself. I actually did read the first few chapters of the book, before calling it quits. It is well written, no doubt. And I’m no scientist, but the science elements contained in the story appear plausible. The protagonist, Mark Watney, is smart, capable, charming––all the attributes you desire in a strong lead character. It’s the morphine I can’t get past. Watney points out at the beginning of the book–which starts with the recounting of how he became stranded on Mars–that if things were to go badly in his attempts to survive the period of four years before the next expedition should arrive to find him, he has enough morphine to end things peacefully and painlessly. It is here, early on in the story, that I lose my ability to identify with the lead character. Give me a week alone on that distant red planet, and I would gobble that morphine like I was raiding my kids’ Halloween candy stash. I actually lay awake the night after reading those chapters, my mind spinning with the same thought, like a weathervane in a hard wind––Morphine. Why didn’t he just take the damn morphine?? It was weird. I’m often moved by stories I read, but I’ve rarely had such a visceral reaction to a story. I’ve been thinking a lot about it lately, and I’m realizing now that my reaction then, and my unwillingness to revisit the tale today, is rooted in fear. It is fear of being stranded, alone. I experienced that same fear when I watched “I Am Legend”. The part that rattled me is where Dr. Neville has to euthanize his dog after she becomes infected with the mutating virus. He loses his only friend, and now he is alone. Alone and more or less trapped in a dead world, full of diseased killers. That would have been it for me, thank you very much. The whole world’s gone to hell, and now I’ve lost my faithful mutt to the killer plague? I’m done. Pass me the morphine. I used to think my reaction to such stories was due to the descriptions of the characters being trapped in some way, and I still think that’s a big part of it. I hate feeling trapped. It elicits a violent turmoil in me. But it’s not just the thought of being trapped that gets to me. It’s the idea of being trapped and alone. That’s it. That is my worst fear. Who would have thought? Like most people of the writerly persuasion, I’m an introvert. I’m not shy; I do enjoy meeting and interacting with people, but I can only handle social interaction for so long before I’m drained. It takes time alone to charge me back up. I’m alone right now. But only sort of alone. In truth, I’m seated in a coffee shop, my ears capped with ear buds, and dozens of people are swarming around me. I’m under no compulsion to interact with these people, but I’m glad they are near me. I like their energy; it helps me breathe. And there is something else. There is you. According to my recent stats, these words will be read by no more than a few dozen people, and maybe fewer than that, since I’ve committed the regrettable sin of posting a blog more than five-hundred words long. So what’s the point? Why do I write something that only a few humans among billions will ever read? It’s about movement. It’s about energy. It’s about the touching of my mind to yours, our participation in a dance as old as humanity itself. Think of how few ways we have of transferring thoughts to one another. We have pictures, we have body language (dance), and we have words––words in all their poetic, musical, storytelling containers. Words are just sounds. Have you ever thought of that? I’m sipping coffee out of something called a cup, but someone had to come up with that word––cup––and enough of us agreed this word was good, so we all started using it. But it was never about the sound of the word itself. It’s always been about the thought, the idea. God, I love ideas. I love ideas and the words we use to convey them. So why am I terrified of being trapped and alone? I’m afraid of no longer being able to transfer and receive this vast wealth of energy generated by humanity. As I write this, I’m thinking of how many people feel trapped and alone much of the time––not on Mars, but right here on Earth. Likely, you and I will come across at least one such person today. I pray I will have the awareness to notice this person when I see him and exchange some energy. Not sure I could be alone on my own planet. But if i was, I would at least need a picture of my wife to “look” at (if you know what I mean), and volleyball to talk to. Ah, yes. Castaway is another one that gets to me. Wilson was definitely the unspeaking hero of that film. He was like the R2D2 of Castaway. Wow… Just wow. Man you write good. Keep up the good work. Thanks so much for reading and for your kind words. I’m glad we could share in that splendid energy.